Want to look dashing? Get the details right! Nothing says you’ve got class more than a well-fitting suit – that’s a fact everyone can agree with, from James Bond to Ron Burgundy. And the key element of a good suit? The jacket. Whether you call it a jacket, a blazer or a shirt-coat it’s what you wear on your top half that says the most about you – which is why it’s worth knowing how to get the details right. Lapels come in a variety of styles, the most common of which are Peaked, Notched (shown here) and Shawl. Some lapels feature a small hole suitable for holding flowers, known as the lapel button. Unlike shirt pockets, breast pockets on a suit are intended to hold only one thing – a pocket square. This prevents weighing the suit down too much on one side and ensures easy access to inner pockets. Essentially a crease which has been sewn into the fabric of the jacket, darts are crucial to create a contoured and well-fitting look. Main pockets on most formal suits are cut into the lining, so they don’t affect the cut or fit of the jacket. 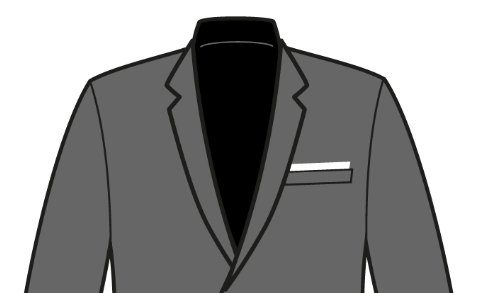 Expensive suits may feature a smaller pocket on the right side, known as a ticket pocket. The break point is the point at which the front sides of jacket meet. Single-breasted jackets feature only a single column of buttons, while double-breasted suits feature two columns for a more formal look. Suits with cuffs that can be undone and rolled up are known as Surgeon Cuffs, after military surgeons who remained in suits throughout operations. Decorative buttons which overlap each other are Kissing Cuffs. Want to look great in your suit? Get it collected, cleaned and delivered with Laundrapp – and order dry cleaning online today.